Removable shields are a piece of brown cardboard that is removable. Its for you to use to stop writing through to the next set when filling out your invoices. Wraparound shields are a piece of white board that is attached to the back of your invoice books and folded in between the invoice sets to stop writing through to the next set when filling out your invoices. 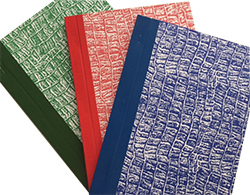 Crocodile Board is a heavy weight board and is ideal if your book is intended for constant daily use and will be subjected to considerable wear and tear. It is an ideal cover for invoice books, quotation books and receipt books. One or two sided print, you can choose to have your terms and conditions etc. printed on the reverse side of you invoice books, there is a small additional charge. Sequential numbering is standard in red ink and free of charge, we can also print your numbering in black or blue ink with a small additional charge. *Dispatch times may vary, please call if your job is urgent. Why not personalise your Triplicate Invoice Books? Design your own Invoice book to include your EFT banking details, company logo, terms of trade or any other personal requirements, all free of charge. Choose from one of our free pre-designed templates, upload your own design or if you need help, we can professionally design your custom made Invoice Books for you (charges apply). Our personalised Invoice Books are cheap compared to our major competitors with no compromise on quality guaranteed. Pick up free from our Sydney metro store in Penrith or delivery is available throughout Australia. Next day delivery is possible to all Australian capital cities, subject to Australia Post next day network. All our carbonless invoice book products are manufactured in Australia and are printed on premium quality stock.